Jet engines are a very unique kind of sound producers. Gaseous or liquid fuel is violently mixed with extremely dense compressed air and then gets burned (don’t do this at home). And this is only one element of the sound. Others are the fan, the compressor, the combustor, the turbine – what the heck – it sounds amazing. 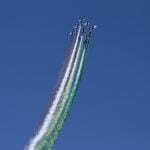 We all know how jet fly bys sound as we’re constantly hearing them above us in passenger airplanes. If you live in a region where fighter aircrafts are practising test flights, you know how low-flying jet engines sound. 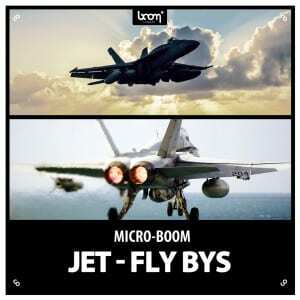 We got even closer with our new Micro BOOM SFX library JET – FLY BYS. We recorded F18 Hornet jets from the United States Navy that were flying VERY low above our microphones. We deliver those fly by sounds in three distances (close, medium, distant) and three different microphone setups (MS, XY, HH = hammerhead, a custom setup our sound designers invented and which is perfect for such recordings). Close and medium have variations containing the typical jet engine whistle. The library comes with 150 files in 96kHz/24bit High Definition Audio and has a size of more than 3.5GB. All sounds are royalty free, guaranteeing you best quality as always. These sounds are perfect for the obvious purposes like jet fly bys but with a little processing they also come in handy for other scenarios like rockets, whooshes and more. 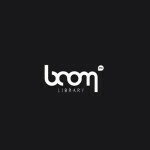 Listen to the audio demo and get your hands on this wonderful Micro BOOM library today to enhance your projects with some supersonic sounds.